Featuring step-by-step, illustrated instructions for over 70 joints, and providing authoritative knowledge on choosing the right joint for the job, The Joint Book fills its niche as a leading resource in a woodworker’s library. No woodworking tool is more satisfying, quick and precise to use than a handplane. Planes can process timber in its rough state, bring boards up to a glimmering smoothness, cut rabbets, dados, grooves and other joints, and trim wood with a precision that has yet to be matched by power tools. Yet many beginner and professional woodworkers are intimidated by handplanes. This book is here to set the record straight. Plus, this edition includes 14 new articles as well as new and updated tool reviews. Handplane Essentials contains everything you need to choose the most suitable plane for your project and your budget, as well as to sharpen it and use it successfully. Compiled from more than 15 years of the author’s writings about handplanes in magazines, trade journals and blogs Handplane Essentials is a primary guide for woodworkers, living up to the root word Essential in its title. An ideal workshop accessory, this indispensable guide to the basic principles of furniture making reinforces David Charlesworth’s status as a dedicated commentator and teacher of the craft. Includes easy to follow instruction on the use of hand tools, as well as ways to build confidence and creativity with useful and often aha-moment techniques. Furniture-Making Techniques encourages beginners and inspires experienced woodworkers through Charlesworth’s deep knowledge of woodworking, and his many tips & techniques on how to get the best from hand tools. In this moving account, Peter Korn explores the nature and rewards of creative practice. We follow his search for meaning as he moves from childhood to novice carpenter, to self-employment as a designer/maker of fine furniture, and finally as the founder of The Centre for Furniture Craftsmanship in Maine. Along the way, Korn asks and discusses what the process of making things reveals about ourselves, drawing on his forty years of hands-on experience to eloquently explore and answer these topics. Vic Tesolin is an avid woodworker and instructor who, as many others do, works within the confines of a small shop. 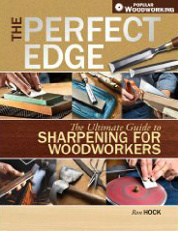 In his friendly, easy-to-ready style, Tesolin takes you through which tools are essential, offers techniques from measuring accurately to sharpening, as well as six projects that are useful, happily repeatable and that build woodworking skills. Although perfect for woodworkers in the position of downsizing, The Minimalist Woodworker is particularly good for the beginner who is appointing a limited shop space on a limited budget and wants to get on with some satisfying projects.